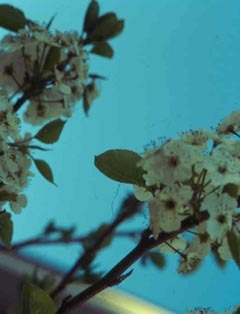 This Tree in Colorado Best below 6000 ft. Callery Flowering pear has many attributes and few faults. After it is established, it is heat- and drought-tolerant. It fares well in urban conditions. 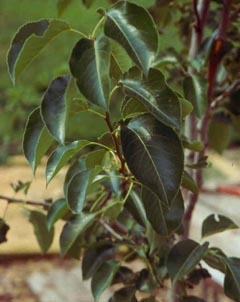 There are several cultivars available. Hardiness Some cultivars Zones 4 to 8, other cultivars Zones 5 to 8. Growth rate and size Medium to fast growth; medium height, generally 40 feet or less; width varies with cultivar. Growth habit Varies with cultivar, from oval to broadly pyramidal to columnar. Foliage Simple, alternate; glossy dark green. 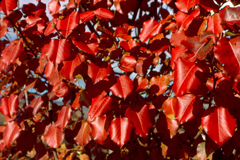 Fall color varies from year to year and varies with cultivar, ranging from red to orange, yellow and purple. Fall color develops late; leaves are held into late November. Flowers Showy, white, approximately 1/2 inch diameter, appearing before and during leafing; pungent to malodorous. Fruit 1/2 inch diameter hard brown pome, russeted, not ornamental; may be taken by birds after fall frosts soften them. Bark Tan-brown when young, lightly ridged and grey-black-brown later. Insects and diseases Aphids on new growth in spring, hawthorn mealybugs; fireblight can be a problem on some cultivars. 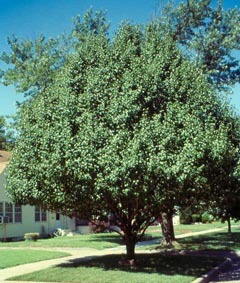 Cultivars ‘Bradford’ was the first cultivar used but develops structural problems with age. Hardier cultivars available locally include ‘Aristocrat’, ‘Chanticleer’ and ‘Redspire’. ‘Stone Hill’ and ‘Cleveland Select’ are similar to ‘Chanticleer’, which has been rated highly in CSU trials. Landscape value Provides 3 seasons of interest: spring flowers, glossy summer foliage and often-spectacular fall color. Tolerant of pollution, compacted soils, restricted rooting areas, drought and heat. Best advice It’s probably best to avoid planting ‘Bradford’. Use ‘Chanticleer’, ‘Stone Hill’ or ‘Cleveland Select’ as an upright screen or near west/south-facing sides of the house. ‘Redspire’ needs more room; use ‘Aristocrat’ as a shade tree in larger areas.